St Photini – The Samaritan Woman! The New Testament describes the familiar account of the “woman at the well” (John 4:5-42), who was a Samaritan. Up to that point she had led a sinful life, one which resulted in a rebuke from Jesus Christ. However, she responded to Christ’s stern admonition with genuine repentance, was forgiven her sinful ways, and became a convert to the Christian Faith – taking the name ‘Photini’ at Baptism, which literally means “the enlightened one”. she sailed to Rome. Her son and many Christians from Africa accompanied her. of followers and she preaches Christ with great boldness. the beating. The saints, however, felt no pain. Nothing happened to their hands. five sisters were brought to the golden reception hall in the imperial palace. daughter Domnina, with her slave girls, to go speak with the Christian women. 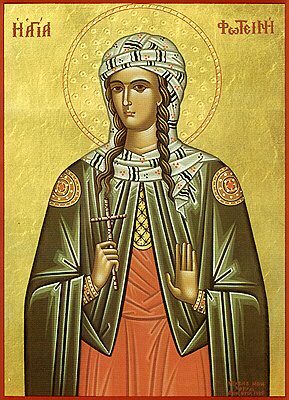 Photini catechised Domnina and her hundred slave girls and baptized them all. For three years they were held in a Roman prison. Photo, Photis, Paraskeve and Kyriake and her two sons, Photeinos and Joseph. Previous Post Why Do We Bless God?